Demonstrators at IGF 2015 in Joao Pessoa, Brazil. Photo shared on Twitter by @NewsRevo. Ellery Roberts Biddle, Lisa Ferguson, Hae-in Lim and Sarah Myers West contributed to this report. At the UN-sponsored Internet Governance Forum in Brazil this week, several activists were stopped from demonstrating in support of net neutrality and against Facebook’s Internet.org application, which is now known as “Free Basics”. Civil society advocates were rattled by the incident, given that the IGF is specifically intended to focus on the protection of fundamental rights online and to welcome participation from all sectors of society. 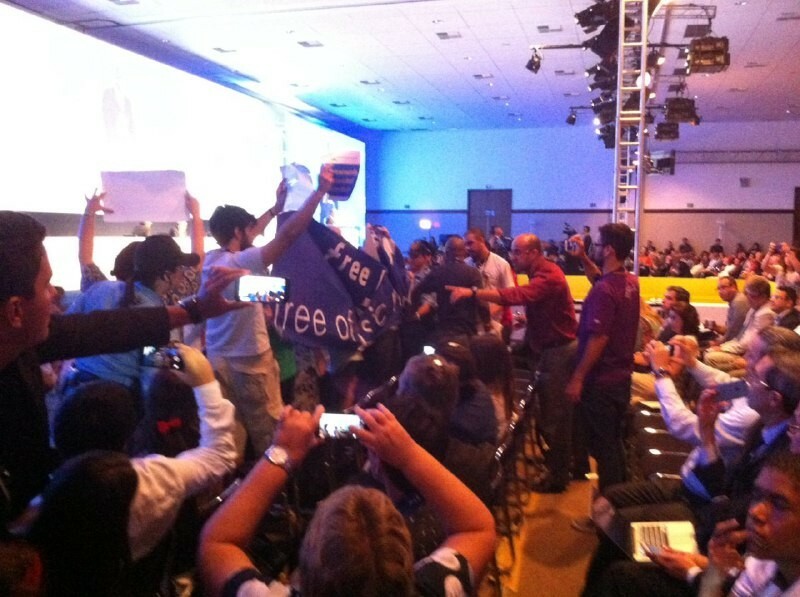 The activists walked through the opening plenary session of the event, holding signs that read “No to Net Neutrality violation in Brazil and all the world!” and “Free Basics = Free of Basic Rights.” Multiple videos captured by conference participants show security guards and UN coordinating staff taking the signs from the demonstrators’ hands and forcibly removing them from the hall. The activists’ identification documents were briefly seized and their credentials were confiscated by organizers. [L]et's let people who cannot be on the stage also symbolically express their key questions regarding the future of Internet in front of high level panels like this. I hope in these days to come, we can discuss this and other issues further….but not only discuss really, let us also protest freely. This is also political space. This kind of repression is incompatible inside an event that is precisely discussing how to protect freedom of speech [on] the Internet and how to guarantee privacy of those who use the world wide web. The activists’ credentials were reinstated several hours after the incident. Russian Internet watchdog Roscomnadzor may soon have additional powers to block websites without a court order. Currently, Roscomnadzor can block sites at the URL level, which prevents Russian users from accessing them but leaves the content available to outside users, as well as Russian users deploying circumvention tools. Under the new expansion, the agency could block websites with the .ru and .рф TLDs not only in Russia, but for users around the world. A local government in the city of Tata in Hungary fined a woman for a Facebook post critical of government spending. Four political activists have been charged under Tanzania’s Cybercrime Act for published an audio message on a WhatsApp group that was “intended to mislead the public” during Tanzania’s October 2015 general elections. The message suggested that the country’s ruling party had engaged in vote fraud, an allegation that both local and foreign media outlets echoed. In a recent review of free expression online in twelve countries in Sub-Saharan Africa, the Gambia ranked right at the bottom, with only Ethiopia ranking worse on Internet freedom. In the past year, the Gambia has jailed online journalists, blocked opposition and news websites, and blocked Internet access entirely, for as long as a full week in April of this year. A proposed law granting greater surveillance powers to UK law enforcement has been described as “worse than scary” by the UN Special Rapporteur for Privacy Joseph Cannataci, and could bring “very dire consequences” according to Apple CEO Tim Cook. Among other things, the draft investigatory powers bill includes one provision that would provide a mandate for bulk surveillance that would allow law enforcement to hack into and plant monitoring tools on computers and phones, and another that would obligate Internet companies to help government officials bypass encryption. The bill was introduced in the House of Commons last week and will now be open for debate. The full text of the Trans-Pacific Partnership, a far-reaching trade agreement governing everything from e-commerce to pharmaceutical trademarks, is finally public. With signatories including Chile, Mexico, Australia, Vietnam, Japan and the US, the agreement may harm individuals’ access to knowledge and digital privacy, as many advocates had feared. University of Sydney law professor Kimberlee Weatherall has published multiple preliminary analyses of the text, alongside her writings on previously leaked copies of the agreement.